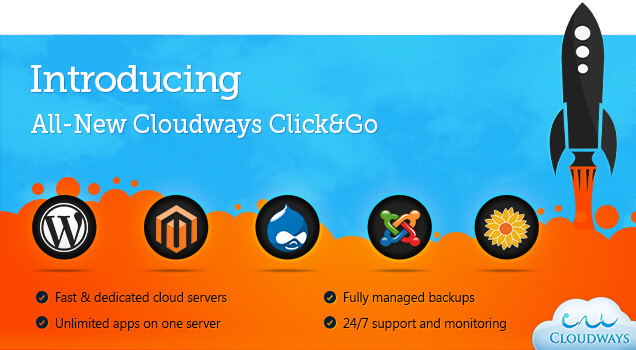 Click&Go: A Faster and Simpler Cloud Solution by Cloudways! The team at Cloudways has been very busy recently—and for a good reason. They have burnt tons of midnight oil to bring us a faster, simpler, and more flexible managed-hosting solution: Say hello to Click&Go by Cloudways. The core objective behind the development of Click&Go is simple: Faster web deployments! So, if you’re among the aforementioned 4 groups and looking for a dependable, manageable, superfast and affordable cloud solution, then your search ends with Click&Go. The entire solution was heavily tested by some of the biggest personalities in the cloud business. This ‘private testing’ led to further improvement to enhance the overall experience of Click&Go. Click&Go offers you a solution to deploy cloud servers within minutes. Yes! Within minutes! Moreover, you can use an app, or a combination of them, on the same server. You can pick any applications you want like WordPress, Magento, Joomla, Drupal, MediaWiki, etc. Performance: To deliver rapid performance, Click&Go is based on the Amazon Web Services (AWS). Moreover, Click&Go uses an optimized mechanism of Apache, Memcached, Varnish and Nginx to deliver a superfast deployment and performance. Convenience: Click&Go incorporates a variety of options to improve convenience for its users. For example, there are 4 different “pay as you go” package plans, 5 different cloud applications, 8 different server locations, flexible scalability options and the ability to install or uninstall as many apps as you want. Heck, you can even uninstall the server if you want! Simplicity: The Click&Go console has been designed for maximum usability and minimum learning curve. Every option in the user dashboard of Click&Go is based on ‘one-click’ rule. Whether it is managing apps or servers, everything can be started, stopped, and restarted with just a single click! Manageability: Click&Go makes it extremely easy for you to manage your server. It provides you an option to monitor 15 different important server vitals like free memory, Idle CPU, traffic stats, etc. Moreover, it also allows you to easily manage the frequency of the automatic backups. If you want, you can always take a manual backup. Scalability: The simple, one-click design of the Click&Go dashboard allows you to change your server specs based on your requirements. 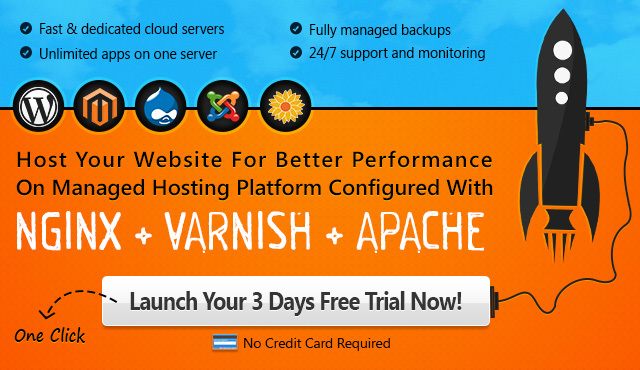 All you need is a few clicks to change your server bandwidth, storage space and other requirements. Yes, it only takes minutes! This is not all. The team at Cloudways informed us that they would be adding more cloud providers, applications, and features with the passing day. To put it clearly, anything short of an apocalypse will be unable to have any effect on your data if it is with Cloudways and Click&Go. I don’t see any reason why anyone would opt for any managed-hosting solution other than Click&Go. Click&Go provides high performance with ease of management and flexibility. The cherry on top is the unbeatable protection and security that Cloudways is renowned for. All put together, it sounds like a very tempting solution indeed. If you’re still a little skeptical, you can try out a free trial of Click&Go and assess its performance yourself. Do let us know about your experience. Happy hosting!